Bring up the words “Scotch whisky” and chances are you’ll land on the topic of Johnnie Walker and stay there. With almost two centuries of whisky blending experience, the world’s most recognised man on the bottle is now more than an icon in the industry. Many have heard about the exceptional blends in the portfolio, and this includes the famous Johnnie Walker colours, most notably the Johnnie Walker Black Label and Blue Label. Yet there’s so much more that defines each blend than its colour. Each is a unique amalgamation of whiskies from all corners of Scotland, carefully put together by Master Blenders with decades of experience before being deemed worthy enough of their ‘colour’. The highly sought-after Johnnie Walker Blue Label, for example, is without fail rich, smooth and alluringly complex, while the Gold Label really accentuates the luxury in blended Scotch whisky. Each a legend in their own right, we break down the profiles of Johnnie Walker’s most prestigious ‘colours’. A harmonious blend of only the best malts from all four regions of Scotland, Johnnie Walker Green Label has a flavour profile that perfectly encapsulates the essence of the country. The combination of Speyside, Highland, Lowland, and Island malts — each matured for at least 15 years in American and European oak casks — embody Johnnie Walker’s distinctively bold personality and smokiness. Here, the refreshing aromas of crisp cut grass and fresh fruit play with warm notes of wood smoke, deep vanilla, and sandalwood. The woodiness continues onto the palate, where the lush fragrance of oak and cedar are combined masterfully with light garden fruits and tropical florals, before culminating with Johnnie Walker’s signature smoky finish and the comforting flavour of sea salt. Its complex — and extremely unique character — has earned it a cult following, which encouraged the label to bring it back in 2016 in response to popular demand. The Johnnie Walker Green Label now sits as part of the Johnnie Walker core range. An intriguing blend of lighter Speyside malts and fruity Highland whiskies (alongside a hint of smouldering embers from the Scottish islands) the Johnnie Walker Gold Label is well-loved for its decadence, especially when it comes bearing luxurious notes of vanilla and dark fruit. The award-winning blend was created by Master Blender Jim Beveridge to celebrate nearly two centuries of the art of blending, and Johnnie Walker’s expertise clearly shines through here. On the nose, the Johnnie Walker Gold Label opens with the enticing scent of honey with slight hints of woodiness. A sip reveals layers of tropical fruit with a distinctly creamy vanilla flavour, which blends seamlessly into a sensational lingering finish. Sitting at the top of the range as Johnnie Walker’s most prestigious blended whisky is the Johnnie Walker Blue Label. The blend — inspired by Alexander Walker’s 1867 Old Highland Whisky — made of the finest and rarest old-aged malt and grain whiskies, is perhaps best known for its multi-layered palate and remarkably smooth finish. Understandably, a Scotch whisky of such calibre is often reserved for special occasions, but its versatility allows for it to be enjoyed any time. On the palate, a velvety combination of honey, vanilla and rose petals gives way to a zesty citrus freshness, before hints of sherry, dark chocolate and hazelnut shine through. 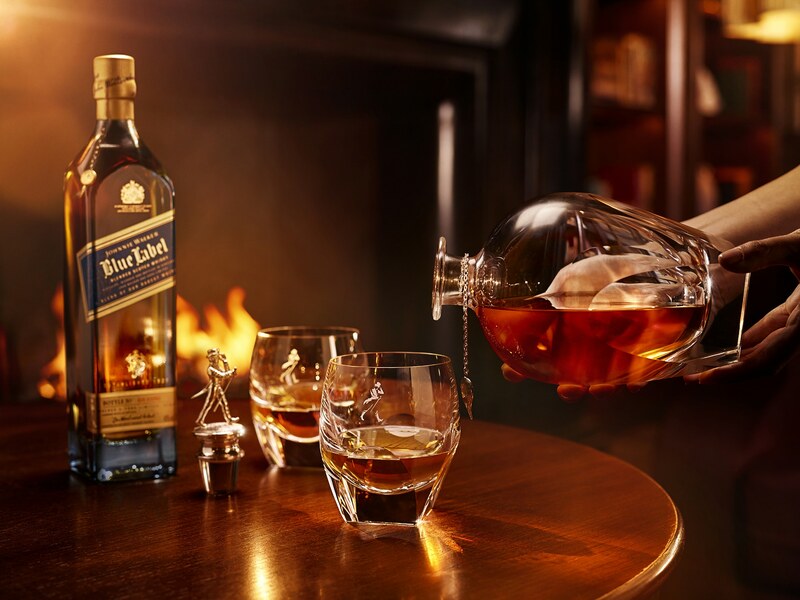 A luxuriously long finish with Johnnie Walker’s trademark smokiness in tow truly sets the tone for the masterpiece. While recommended neat or on the rocks, the Johnnie Walker Blue Label also makes for a glorious addition to cocktails, such as the universally popular Highball, or the classic Old Fashioned.